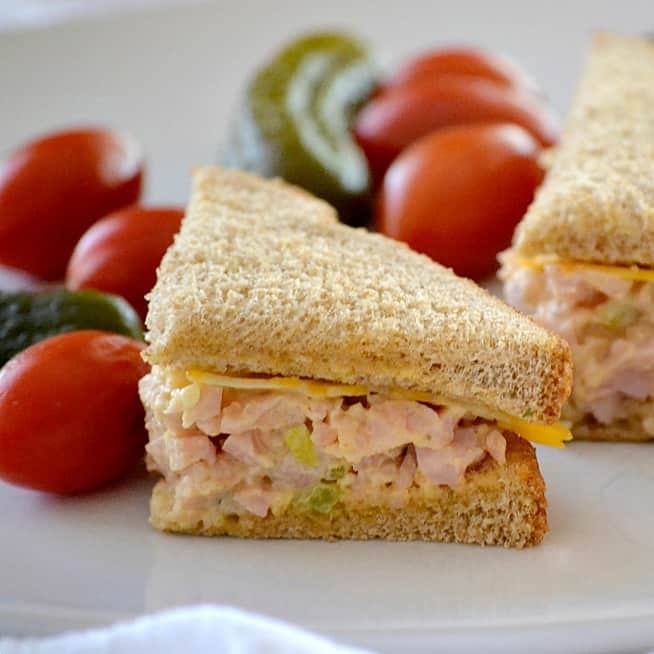 Easy Ham Salad – chopped ham, mayo, mustard, pickle relish and a touch of Sriracha will make this sandwich fixing a new back-to-school favorite. 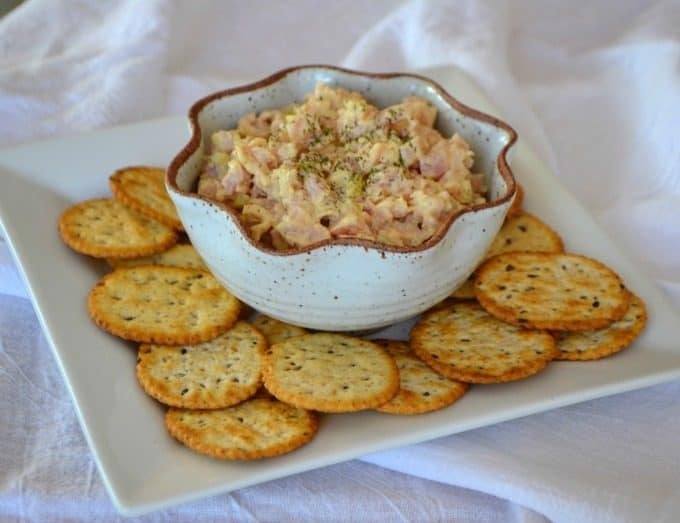 This Easy Ham Salad is one of my new favorite recipes! Believe it or not, I’ve never even had ham salad, and didn’t even know there was such a thing until I was talking to a friend about ham recipes. What?? Ham salad, like chicken salad?? Growing up in Rhode Island, it wasn’t something mom or Grandma made. I lived a sheltered life, what can I say? 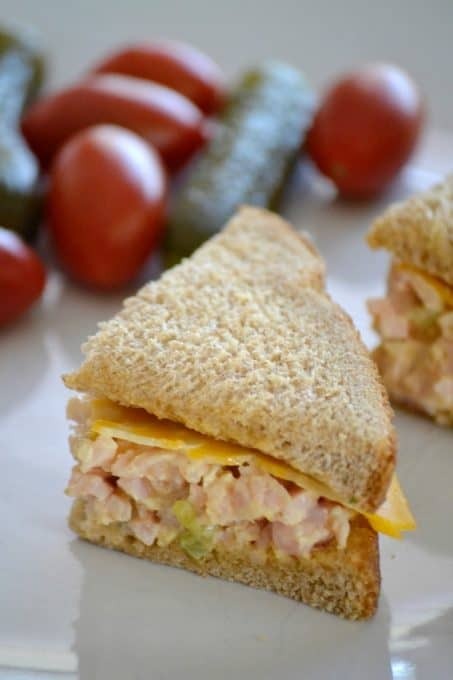 I really liked this Easy Ham Salad because not only can it be put into a sandwich for the kids to take to school, but you can also serve it as a party appetizer with crackers and those cute little slices of party bread. It would even be delicious at a tea party with cucumber sandwiches. The possibilities are endless! I was very happy to hear that in addition to the turkey at my local grocer’s deli counter, Butterball’s NEW ham is available as well! We can enjoy our favorite meats from them all year ’round now! Made from quality ingredients, just like the turkey, Butterball ham is made from premium pork cuts and comes in three different flavors – Black Forest, Honey Baked and Virginia Baked. 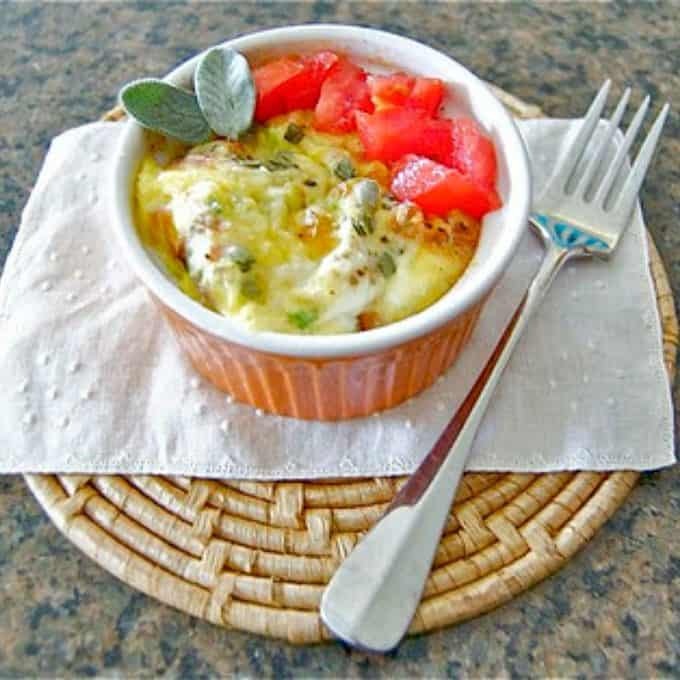 Be sure to ask for it at your local grocer’s deli counter so you can make this and other recipes! I love to make grilled ham and cheese sandwiches. It’s great knowing that I can go to my local deli counter, order my NEW Butterball ham both in thin AND thicker slices giving me the versatility to use it in a variety of recipes. 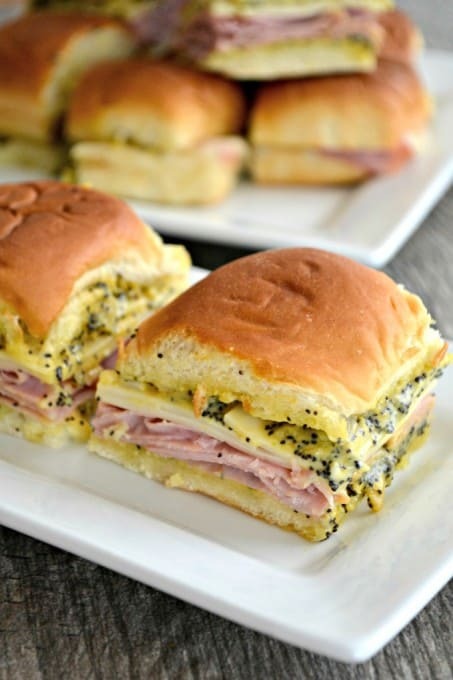 I use the thin slices in sandwiches or Chicken Cordon Bleu. For my Easy Ham Salad recipe, I specifically asked the person at the deli counter for a thick slice of the Butterball Ham, weighing the 1/2 pound. This larger slice made it easy for me to cube at home and place into my food processor. I also asked for a second thick slice which I cubed and served with the variety of ingredients pictured below. 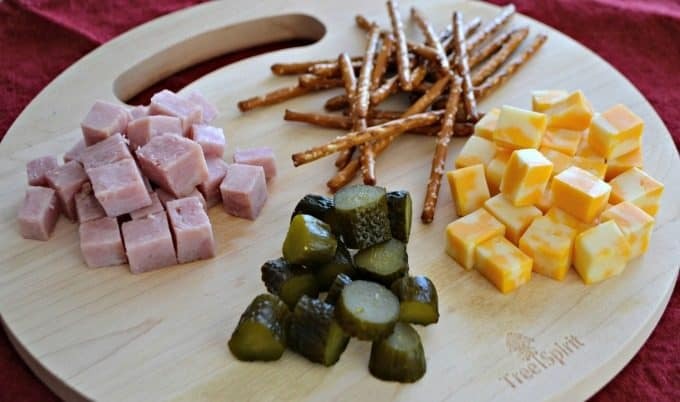 The pretzel sticks, cubes of cheese, sweet Gherkins and Butterball Ham made for a fun and easy snack that my son and his friends really enjoyed. They loved munching on it so much that I refilled it at least twice. Those thick slices of ham are also great to cut and use in a Ham & Split Pea Soup. I put just a touch of Sriracha into this Easy Ham Salad recipe, but depending on your family’s level of spiciness, you can add more or less or completely omit. It was just enough to add a nice little kick to it. 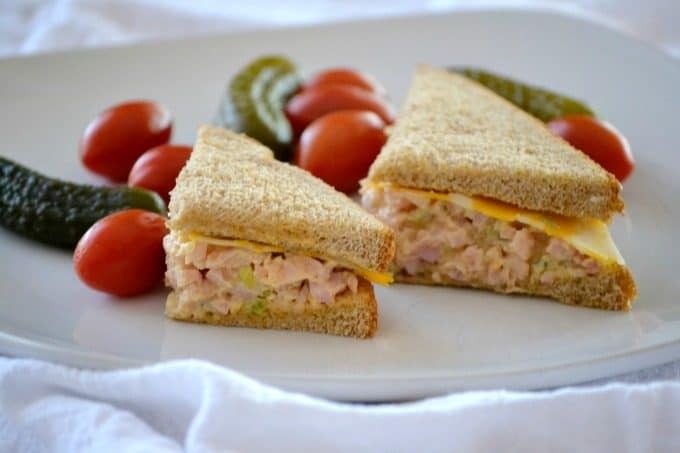 This Easy Ham Salad with chopped ham, mayo, mustard, pickle relish and a touch or Sriracha will make this sandwich fixing a new back-to-school favorite. Cut the 1/2 lb. slice of Butterball Honey Ham into 1-inch cubes. Place them into a food processor and pulse 4 - 5 times until ham is shredded. In a medium bowl, mix together the mayonnaise, yellow mustard, both relishes, and Sriracha. Add the ham and mix completely. 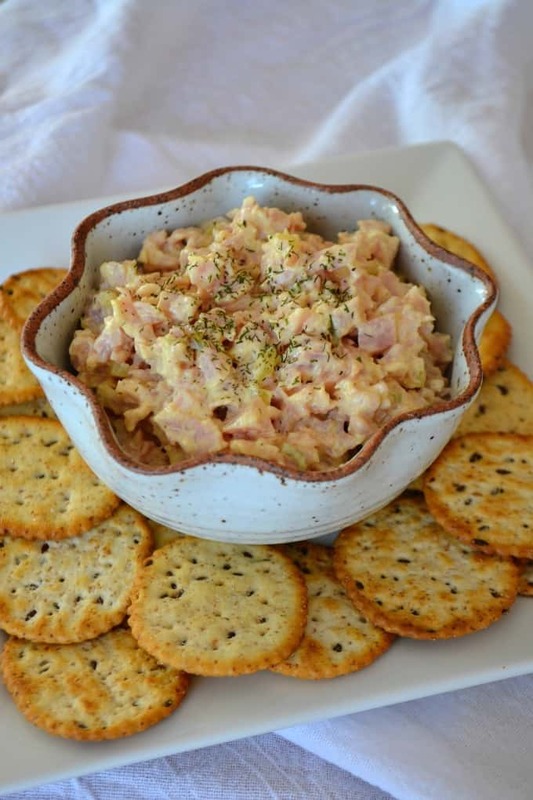 Serve the ham salad with crackers or on bread with your favorite slices of cheese. 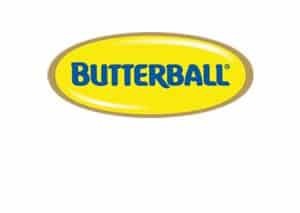 This is a sponsored conversation written by me on behalf of Butterball . The opinions and text are all mine.